Every election year, the Maryland Catholic Conference surveys the state’s candidates for U.S. Congress, Governor, and the Maryland General Assembly on their positions regarding issues of interest to Catholics. 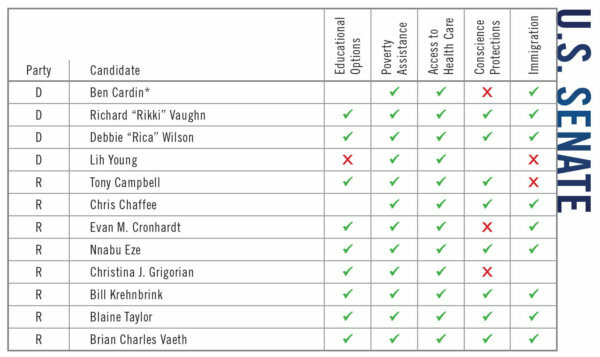 The candidates were asked to either “agree” or “disagree” with a list of issue statements. The ✓ indicates the candidate agrees with the statement. The ✕ indicates the candidate disagrees with the statement. A blank response means the candidate did not choose a position on that issue. Candidates were given the opportunity to provide a brief statement at the end of the survey on why Maryland Catholics should vote for them. Those comments are available on the Maryland Catholic Conference website: ­mdcatholic.org/elections. Each candidate received the survey by email. Only candidates who responded to the survey are included. 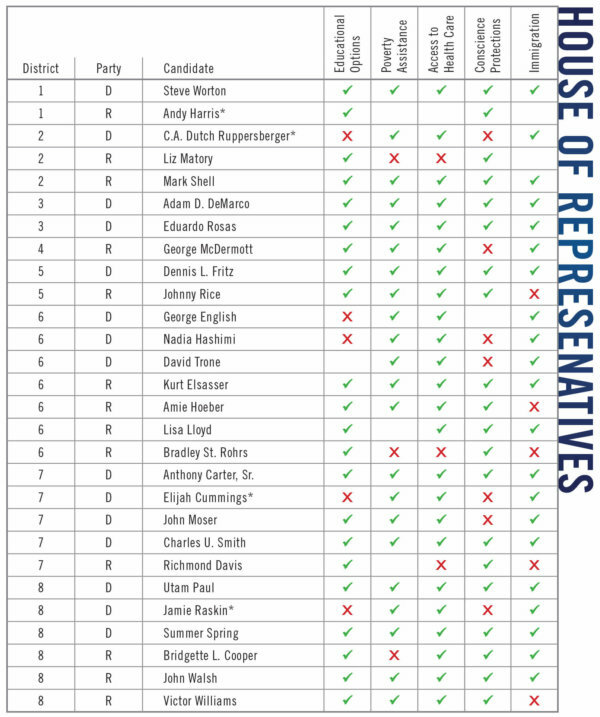 Non-responding candidates received the survey by email multiple times and were contacted at least once by phone, if a number was provided to the Maryland State Board of Elections. To find your district, click here. The MCC does not endorse or oppose any candidate, under any circumstance, and no inference of endorsement or opposition should be concluded as a result of the information provided here. Educational Options. Congress should enact legislation that supports the ability of low-income families to choose the education best suited to their children’s needs, such as tax credits for business donations to organizations that provide scholarships for K-12 students to attend nonpublic schools. Poverty. The Supplemental Nutrition Assistance Program (SNAP), the Emergency Food Assistance Program (TEFAP) and other similar initiatives provide funding for millions of poor Americans who cannot afford to adequately feed themselves or their families. Congress should oppose attempts to reduce funding for these initiatives as a means of trimming budget deficits. Health Care. Congress should reject structural changes to Medicaid, such as a per-capita cap or other provisions, which would leave millions of people that rely on Medicaid, including many children, at risk of losing access to health care. Any modification to the Medicaid system as part of health care reform should prioritize improvement and affordable access to quality care over cost savings. Conscience Protections. Congress should pass legislation, such as the Conscience Protection Act, to strengthen the enforcement of existing conscience protection laws by establishing a private right of action allowing providers who are discriminated against because of their refusal to perform, refer for or pay for abortions to defend their rights in court. Immigration. Congress should pass comprehensive, bipartisan immigration reform providing a path to citizenship for undocumented persons in the U.S., while preserving family unity and restoring due process protections to enforcement policies. Tuesday, June 5: Deadline to register to vote and/or change party affiliation for the primary election. Click HERE for more information and for locations. Only candidates who responded to the Maryland Catholic Conference survey are included. Candidates’ written comments to the survey questions are available at the Maryland Catholic Conference website, mdcatholic.org/elections. Assistance for the Poor. Funding in Maryland’s budget should be maintained, and when necessary, increased to provide low-income residents access to basic necessities, such as food, housing, and healthcare. Abortion. Maryland is one of four states to voluntarily direct state Medicaid funds to pay for all or most medically necessary abortions. The Maryland General Assembly should pass legislation to restrict the use of taxpayer dollars for abortion. Immigration. Maryland should prioritize protecting family unity by passing legislation that, except for cases involving individuals with serious criminal records, limits the participation of local law agencies in federal immigration enforcement efforts. K-12 Educational Options. The State of Maryland should continue to expand existing funding to provide scholarships for low-income students who wish to attend the K-12 nonpublic school best suited for their educational needs. Physician-Assisted Suicide Ban. In 1999, the Maryland General Assembly passed legislation making it a felony for an individual to assist in another individual’s suicide. Maryland should uphold the law in its current form and reject legislation to legalize the practice of physician-assisted suicide.